One of the big reasons the Bucks went from 15 wins in 2013-14 to 41 wins last season was an increased emphasis on defense under new head coach Jason Kidd, and specifically improving their numbers in steals. Here’s six stats you may not know about that improvement in steals. The Bucks went from 26th in the league in total steals in 2013-14 to first in that category last season. They led the NBA with 9.6 steals per game. 2. 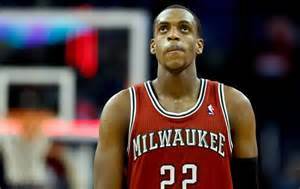 Khris Middleton led the team with 123 steals. He became the 29th player in Bucks history to have over 100 steals in a season. His 123 steals places him in a tie for 27th place on the team’s all-time single-season steals list. 3. The last Bucks player to get 100 or more steals in a season was Monta Ellis in 2012-13. He had 169 steals that season. 4. Twenty-nine Bucks players had 100 or more steals in a season in a total of 67 seasons. Topping the list is Quinn Buckner who had over 100 steals in six seasons. Those Bucks players with 100 or more steals in the most seasons: Marques Johnson, Sidney Moncrief and Paul Pressey (five seasons); Terry Cummings, Jay Humphries and Brian Winters (four seasons). 5. Alvin Robertson holds the Bucks single-season record for most steals with 246 in 1990-91. He had more than 200 steals in three seasons with the Bucks, the only Milwaukee player to have over 200 steals in a season. 6. Led by Robertson in 1989-90, 1990-91 and 1991-92, the Bucks led the league in steals in those seasons. Last season was the first time they led the league in steals since that 1991-92 campaign.